This quilt was designed for an invitational exhibit sponsored by the Association of Pacific Northwest Quilters. The theme of the traveling exhibit was: “Telling Secrets”. This quilt was displayed and auctioned to the highest bidder at the Pacific Northwest QuiltFest Exhibit in 2004. My design challenge was to make a quilt to a specific size, and it was a challenge! I incorporated a fabric hand-dyed by Judy Robertson’s (Just Imagination™ ) and another hand-painted fabric by Mickey Lawler ( SkyDye™. ) 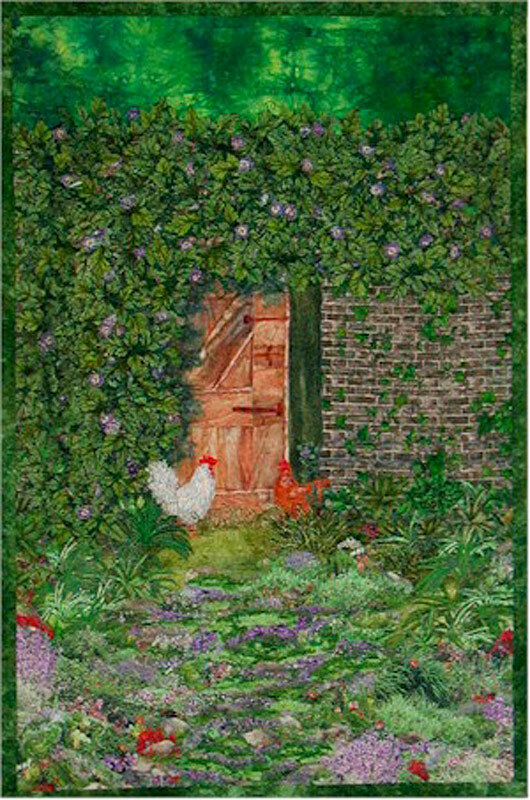 Using textile paint, I hand-painted shadows on the door and added detail with extensive machine embroidery. I used a very pricey Japanese commercial fabric for the garden effect fabrics in the foreground.